Our main goal is to make all your dental visits to our office anxiety free and as comfortable as possible. (408) 927-0400 or drop in to make an appointment. welcome to our dental care office! For the last 20 years, our mission has been to strive to improve the overall health of our community as it pertains to our practice. Through much dedication, this office has always been focused on providing the utmost quality of dental care to the general population without exception. Our commitment to our patients has always been our number one goal. Thus, the office and its staff concentrate to provide a comfortable and friendly environment in which every individual feels at ease. Gum disease is a swelling or soreness of the gums (the soft tissue) around your teeth. It is caused by the bacteria in plaque, a sticky colorless film that forms on your teeth. The plaque bacteria have toxins that inflame the gums. If you do not remove plaque by brushing and flossing your teeth, it can build up and infect your gums, teeth, and the bone that supports them. If not treated by a dentist, you can lose your teeth. The signs of gum disease are not always easy to see and can be painless. The earlier gum disease is caught, the easier it is to treat. That's why it's important to see your dentist regularly. Gums are mildly sore, maybe red or puffy and may bleed during brushing. This is the first sign of gum disease. Your gums may feel tender and you may see some bleeding when you brush or floss. 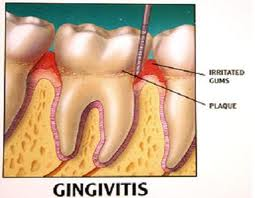 The American Academy of Periodontology considers gingivitis a mild periodontal disease. Gingivitis can be reversed by having a dentist or hygienist clean your teeth and with proper brushing and flossing at home. Gums pull away from the teeth. This lets plaque move toward the roots, supporting fibers and bone. At this stage, plaque spreads to your tooth roots causing an infection, which can damage the bone and fibers that hold teeth in place. Your gums may begin to pull away from your teeth. Proper dental care and better home care can help stop more damage. 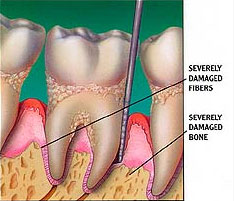 This is the final stage of gum disease, the fibers and bone holding your teeth in place is destroyed. This can cause your teeth to shift or loosen and can affect your bite. If treatment can save your teeth, they may need to be removed. •	Gums that bleed or are red, puffy or swollen, or sore. •	Gums that have pulled away from your teeth. •	Changes in the way your teeth fit together when you bite. •	Pus that appears between your teeth and gums. •	Constant bad breath or bad taste in your mouth. Your oral health care provider can tell for sure if you have gum disease. That's why it's so important to have regular dental checkups. During scaling, plaque and tarter are removed from the crown and roots of tooth. •	Brush and clean between teeth with floss or interdental cleaner the way your dentist tells you to do. •	Brush with an ADA Accepted anti-gingivitis tooth paste, such as Colgate Total, and use a soft-bristled tooth brush. •	You dentist may prescribe a special rinse such as Colgate PerioGuard to help fight gingivitis. •	Get professional dental cleanings. This is the only way to remove plaque that has built up and harden into tarter. Your dental professional will clean or "scale" your teeth to remove the tarter above and below the gum line. •	Do not smoke cigarettes or use other forms of tobacco. •	If your condition is very serious, surgery may be needed. Your dentist will tell you whether or not you need surgery. If you agree, the surgery can be done here at our clinic. •	Get regular checkups. They're the best way to discover and treat early g um disease before it leads to a more serious problem. Dental implants are artificial tooth root that are placed in the area of a missing tooth normally occupied by the missing tooth, eventually fusing with the jaw bone to create a strong support for an artificial tooth, or dental crown. •	Replace one or more teeth without affecting adjacent teeth. •	Support a bridge and eliminate the need for a removable partial denture. Without a tooth root replacement to stimulate the jawbone, the bone can began to atrophy. Dental implants unlike dentures that sit on top of the gum provide crucial and enduring support to prevent bone atrophy and damage to surrounding teeth. Not everyone is a candidate for dental implants. An ideal candidate should be in good general and oral health with proper bone density and good oral hygiene. Surgery is required to prepare the site for an implant. After the implant is placed a period of time is required for the implant to take hold and for the bone to grow around the implant. When the dental implant is fully healed, a metal post or abutment is inserted into the implant that connects the crown to the implant. When all natural teeth are lost, whether due to periodontal disease, tooth decay, or injury, complete dentures can replace your missing teeth and your smile. Replacing missing teeth will improve your appearance and your health. Without support from the dentures, facial muscles sag, making you look older. A complete denture may be either conventional or immediate. A conventional full denture is made and placed in the patient's mouth after all the remaining teeth has been removed and the tissue given enough time to heal, which may take up to 6-8 weeks. During this time the patient will go without any teeth. Immediate dentures are made prior to removal of all the remaining teeth and placed in the patient's mouth immediately after all the remaining teeth been removed. With immediate dentures, the patient does not have to go without teeth while tissue is healing. With immediate dentures, once the tissue heals, further work will be needed. Even if you wear full dentures, you still must take good care of your mouth. Brush your gums, tongue, and palate regularly with a soft-bristle brush every morning prior to inserting your dentures to stimulate circulation and remove plaque. Root canal is a treatment used to save and repair tooth that is badly decayed or infected. Inside each tooth is the pulp, which is the inner chamber of the tooth containing blood vessels, nerves and other tissues, and it runs like a thread down through the root. When the root is diseased or injured, the pulp tissue dies. 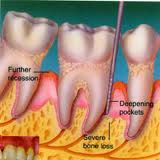 If the diseased tissue is not removed, it can cause infection or abscessed tooth. Root canal therapy can be performed in a single or multiple visits. During the first visit, a small hole is created to access the pulp chamber. Tiny files are used to remove the nerves and infected tissue from the tooth. Inner chamber is cleaned and disinfected, and the tiny canals are shaped. The cleansed chamber and canals are dried and filled with material (gutta percha). Gutta percha is a rubber material designed to seal the inside of the tooth to prevent infection. Many factors, including dietary habits like drinking coffee, tea, soda, and red wine or eating berries or using soy sauce, and certain medications can affect the whiteness of your smile. Teeth whitening is an affordable and effective way to combat common causes of tooth discoloration. We offer two whitening systems to fit our patient's life styles and budget considerations. In-office whitening which is a chemically activated whitening treatment that offers amazing results in about an hour. This dentist supervised, in-office procedure is safe and effective, and offers a brighter, whiter smile after just one appointment. We also offer a take home whitening kit, where the whitening gels are delivered via customized bleaching trays. The sticky, viscous gel won't migrate to the gums and most formulations (of both in office and take home kits) include potassium fluoride (PF), which helps to improve oral health by strengthening enamel, decreasing sensitivity, and offering increased cavity prevention. Take home whitening gels can provide results just after one night; though expect to see results in about a week. Before using either system, patients should have a comprehensive exam and cleaning done to evaluate if they are good candidates for such whitening methods. Some patients are not ideal candidates, due to reasons such as the presence of crowns or other cosmetic dental work. Natural teeth will lighten, but crowns, veneers, and bridges will not. Also, candidates must have a recent cleaning and exam before whitening is recommended. Patients should keep in mind that drinking coffee or tea, red wine, and smoking cigarettes will gradually diminish the effects of any whitening process. A crown or cap is an artificial tooth that restores, shape and protect, and strengthens a badly damaged tooth by fitting directly over an existing tooth. Crown can be used to attach a bridge, prevent a weak or brittle tooth from breaking, or restore one that is already broken. A crown also can be used for aesthetic to cover teeth that are discolored, badly shaped, or out of position, to restore them to there natural appearance. Crowns also are used to fit over implants. Crowns can be made of porcelain or gold. It is very durable and is made to fit the tooth precisely. Crowns are cemented in place. Bridges are custom-made appliances designed to replace missing teeth, by returning your natural looking smile and to help maintain the shape of your face, and to establish a proper bite relationship. Bridges are also called fixed partial dentures since they are cemented to surrounding teeth or implants. Bridges can be made from gold, alloy, or a combination of these materials. Unlike a removable bridge that can be removed by you, a fixed bridge can only be removed by a dentist. An implant bridge attaches artificial teeth directly to the jaw or under the gum tissue. The success of any bridge or implant depends on its foundation, the other teeth, gums, or bones to which it is attached. It is very important to keep your remaining teeth, gums and jawbone healthy and strong. Tooth extraction can be due to any number of reasons and is determined by you and Dr.Odishoo. There are times when it is necessary to remove a tooth. Sometimes a baby tooth has a long or misshape root that prevent it from falling out and the tooth must be removed to make room for the permanent tooth to erupt. At other times, a tooth may be severely decayed, have advanced periodontal disease, or have broken in a way that can not be repaired, so Dr. Odishoo may recommend removal and replacement with a bridge or implant. Infection, preparation for orthodontic treatment, or problems with a wisdom tooth can also require removal of teeth. Any time a tooth is extracted it can lead to problems related to your chewing ability, shifting teeth, problems with the jaw joints, which can impact your future dental health. 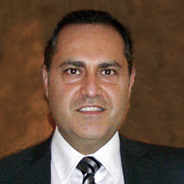 To prevent future complications from extracting a tooth, Dr. Odishoo will discuss the alternatives to extractions and replacement of an extracted tooth.